OK, this one is heavily influenced by Japanese prints but may be a bit to much my design to look as Japanese as it should, or I would like. 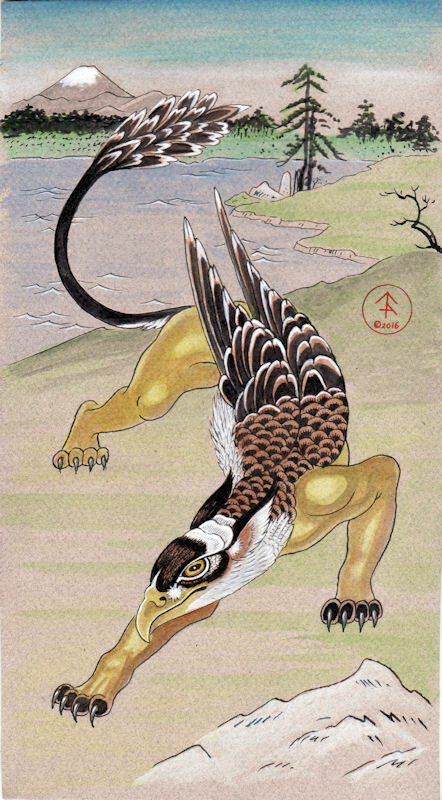 I have done several Gryphons in the Japanese style but none quite like this one, anyway..."Stalking Gryphon", 6 1/2 x 11 1/2, Micron pen, watercolor colored pencil, ProWhite and Acrylic on Canson board. Original and prints for sale. I really like this! It has a nice flow to it and while it is distinctly Japanese themed, it also has your flavor as well. Nicely done!